"Principal Varieties of Garden Vegetables Approved for Registration - 1931 - By: Canadian Department of Agricluture. " (1492) Principal Varieties of Garden Vegetables Approved for Registration - 1931 - By: Canadian Department of Agricluture. -Condition: Good Plus Informational pamphlet. 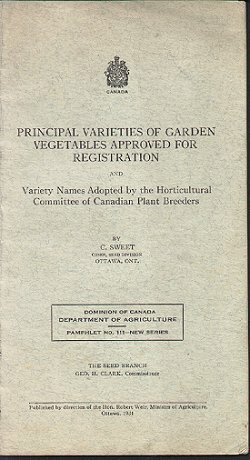 Pamphlet includes a list of vegetables which the Horticultural Committee of the Canadian Seed Grower's Association considered desirable to grow in Canada. The list includes the main category of vegetables and then the varieties. Pamphlet measures 4 1/2" by 8" and has 13 pages. Price: $4.00 + shipping.